She doesnât celebrate Motherâs Day and so Jennifer Eustace will not be expecting any gifts, but her own mother, who does celebrate, can expect a bouquet of flowers and a bottle of wine. Raised in Barbados, the Eustace children, Ajene and Maia, were taught to respect all mankind and to see each person as special and important. Their privileged lifestyle was never to be used as an excuse to walk on others. âThey were brought up to be people oriented and to look out for the less fortunate,â stated the proud mother. 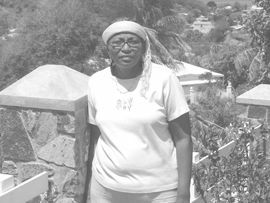 She remembered while her children were in primary school during times of flooding in Barbados she would go to pick up her children from school early. âMy daughter would have all these children who didnât have transport waiting for me to carry them home.â She would then transport the children to their various homes. This, said Mrs. Eustace, was part of her childrenâs training for life. High on Jenniferâs list of priorities as a mother was teaching her children the value of their education. âBy the time my children were in first form they had already read all the (English Literature) texts assigned from first form to fifth form, remembered the very outspoken mother who also stressed to her children the importance of learning Standard English. The young Eustaces were encouraged to express themselves properly, and learning to play an instrument and a sport well was also a must, as she sought to make them âwell rounded children.â Conceding that the busy lifestyles of herself and her husband curtailed any notion of more children, Mrs. Eustace admitted, âSometimes I wish I had moreâ. When this reporter suggested that it wasnât too late, even the honourable opposition leader who was on his way to Parliament at the time of this interview couldnât help looking amused and raising his eyebrows. Mrs. Eustace, a chartered accountant and former audit manager with the renowned company Coopers and Lybrand and Finance Manager for nine years at Vinlec told SEARCHLIGHT that as a principle, a vote was taken on all major issues in their family. She recalled the vote being tight when a decision was to be taken on her husbandâs desire to enter the political fray. âMy daughter was for it but my son was not.â When her turn came, she encouraged them to support their father in what he wanted and swayed the vote. Her son, who was a student at Community College when Mr. Eustace entered active politics, usually got upset when negative, unfair remarks were made about his father. The two have maintained a very close relationship, to Jenniferâs delight. Jennifer, the second of five children born to her parents, told SEARCHLIGHT that she believes that parenting must be viewed from the national level. So when she is not busy with her banana farm, the passionate educationist is heavily involved in career guidance. âI have a passion to see our nationâs children develop and grow.â She is also heavily involved in guiding the children of her workers at her Diamond farm, continuing to share her motherly love around. âChildren must be prepared for parenthood, jobs and financial management,â ended Mrs. Eustace.